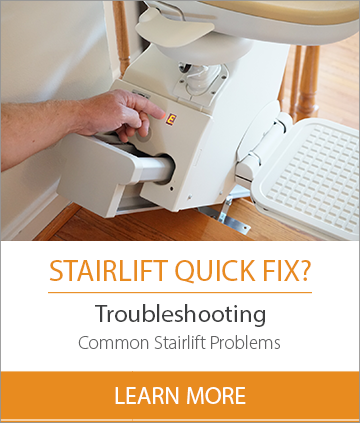 Stairlift repair technicians that have been delivering dependable chairlift services throughout the Northern Virginia/DC Metro area for over 25 years. Our team of certified technicians and staff are committed to a tradition of customer care and service excellence. As a full service provider we are able to meet all your lift needs including repairs, general maintenance, installation and removal. When your lift needs a repair there are many possible reasons it is not working. Stairlift repair and servicing should always be done by an experienced technician. Our qualified technicians will be able to locate the problem within a few minutes and begin the repair. We service most major brands and specialize in Acorn chairlift repair, AmeriGlide Horizon, Brooks, Bruno, Bison, Harmar, HandiCare, Precision curved stairlifts, Stannah, Sterling, and ThyssenKrupp Access. We also carry common replacement parts or have them in stock and readily available to assure continued operation. When calling it is helpful to know the make, model and approximate year the stair lift was manufactured. If you are not sure try our stair lift identifier to assist in finding what model lift you have. There are also times when a lift is beyond repair and will need to be replaced. We provide new and used lifts to meet most budgets. Contact us at 866-721-6004 to schedule a repair today.